By Zhang Jiadong (20 August 2018) – When Indian Prime Minister Narendra Modi came to power, people believed that his policy on China would promote relations. Although some of Modi’s steps improved ties in the short run, no significant improvement was noticed and relations took a big hit. Modi recalibrated India’s foreign policy and adjusted his diplomatic team. This brought new challenges to Sino-Indian relations. Modi gradually abandoned the non-aligned principle which India stuck to during the Cold War. He also relinquished India’s tradition of keeping an equal distance from major powers. Such changes made people look at China-India relations with hope. Together with Chinese President Xi Jinping, Modi tried to promote ties which peaked when President Xi visited India in September, 2014. It appears that India wants to seek close ties simultaneously with different countries. However, India’s “partnership” actually makes it a soon-to-be ally of the US and the West, and also the US’ “major defense partner” and “major non-NATO ally.” It sours the strategic cooperation between China and India. In 2017, Indian troops illicitly entered Doklam, an undisputed Chinese territory. It is Modi’s attempted break of the alleged China’s containment policy toward India, and also a strategic risk. India once gave up the tradition of China-India cooperation in multilateral mechanisms. BRICS used to be an important cooperation platform for Beijing and New Delhi. After being upset by the episode in which NATO used UN Security Council to set up no-fly zones in Iraq, China and India opposed American and Western unilateralism. From the 2012 Delhi Declaration to Xiamen Declaration in 2017, BRICS respected all countries’ sovereignty, independence and territorial integrity. They together condemned the aggression against Libya and Syria, warned that the threats to Iran shouldn’t escalate into confrontation, and appealed for a multipolar world order. It was the strongest criticism of the West since the end of the Cold War. 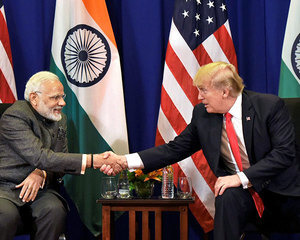 Now India has made it clear that it will not approve of any declaration or statement that opposes the US, no matter it is in BRICS or the Shanghai Cooperation Organization. Modi has restructured the foreign policy decision-making team. He did not pick any member of the team from the time Indian National Congress was in power. Although it is in keeping with party politics, Modi also kept a distance from the team of former prime minister Atal Bihari Vajpayee, a member of the ruling Bharatiya Janata Party (BJP), who passed away last week. As a result, Modi’s foreign policy team has been left with neophytes in foreign affairs. The efforts of previous leaders in promoting China-India relations were not carried forward. President Xi visited India in September 2014. Although his visit drew a lot of attention, its strategic meaning didn’t receive due attention. India focused on resolving specific bilateral issues, but it neglected former Chinese and Indian leaders’ consensus: the two countries should seek cooperation in the whole world. Thus, China and India have changed their focus from establishing a new world order to grappling with complicated bilateral relations, especially territorial disputes. After Modi assumed office, India’s foreign policy leaned to the US. India is promoting relations with the US, winning economic interests and coping with “China threat.” It uses the strategic dispute between China and the US to maximize its interests. That has become a new strategy for India’s major power relations. China basically failed to pull India back to a traditional, neutral policy, and had to choose the old policy of supporting Pakistan. All this led to the 2017 Doklam standoff. Although Modi said “not a single bullet has been fired at the Sino-Indian border in the last 40 years,” the Doklam crisis came most close to an armed conflict since 1962. This has prompted both sides, especially India, to rethink its policy on each other. Modi will continue to play a special role in China-India relations. He is like Jawaharlal Nehru, Indian’s first prime minister, who showed a change in his own policies. Nehru failed to use the two countries’ friendship and then made a break with China. Likewise, Modi showed a friendly gesture at first, but because of later indiscretions things went close to a military conflict. However, Modi is more pragmatic. After relations nose-dived, he tried to fix it to serve his political interests. People still need to wait and see the results of the 2019 Indian general elections. If Modi’s BJP is still in the lead, he might continue the current policy on China. However, it’s hard for Modi to do so if BJP fails. The potential disputes will emerge again and harm China-India ties.